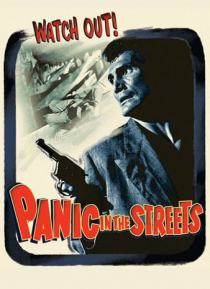 Filmed entirely on location in New Orleans, Panic in the Streets stars Richard Widmark as Dr. Clinton Reed, a physician from the U.S. Health Service who must race against time to stop a plague. The carrier was an illegal alien, murdered by criminals Jack Palance and Zero Mostel. When local officials note the strange condition of the corpse, they fear that the germs will spread to epidemic proporti… ons, and thus summon Reed to wrest control of the situation.